Whether you are an established company or an innovative entrepreneur, you need a long-term and targeted IP strategy that can transform your ideas into a marketable product. However, an IP strategy is about more than just protecting your patent, trademark or design. Used properly, an IP strategy can help you to obtain new investors and increase the company’s overall value. In other words, there are several good reasons for establishing an IP strategy. With a good IP strategy, you are able to identify new business opportunities for your company and achieve a stronger position in the market. An IP strategy is also about analyzing your competitors’ existing IP activity, which allows you to develop a strategy while avoiding unpleasant infringement cases. Contact us and find out what we can do for you and your business! To what extent is a company’s market value affected by a good IP strategy? Samsung’s shares plummeted by nearly 7.5 percent after the company lost a patent infringement case to Apple in August 2012. The final ruling resulted in Samsung having to wave goodbye to 12 billion dollars in market value overnight. At Plougmann Vingtoft, we assist your company in all aspects of establishing an IP strategy, from the initial strategic considerations before initiating a large development project to the actual implementation and execution. Freedom to operate – get an overview of whether a product is able to be launched on the market or if it is already covered by the rights of others. Patent mapping – an overview of the technical areas, where it may be relevant for you to focus your energy and IP activity. IP commercialization – commercial analysis and assessment of your patent portfolio as well as the identification and establishment of potential partners for cooperation and/or licensing. Strategic consulting/optimization in relation to existing portfolios. Strategic advice in relation to conflict cases. Surveillance of your competitors’ activities. Innovation accelerator – get inspired by the knowledge available in patent databases for research and development. To learn more about how we work with a client’s IP strategy, read the story of the Norwegian start-up company Kitemill whom we assisted in their efforts to revolutionize the wind industry with their innovative technology. You are always welcome to contact us for an informal discussion of your IP strategy needs. 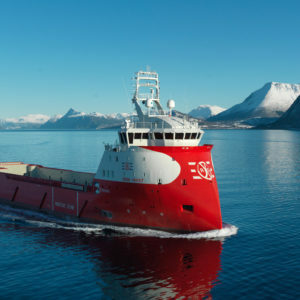 The X-BOW® by Ulstein Group is an award-winning ship’s bow design that enables vessels to cut more smoothly through water in high seas compared to normal ships. The invention is protected by a threefold IP strategy developed in collaboration with Plougmann Vingtoft.